What Is a Good Wood Fence Stain/Sealer? Earlier preservative finishes intended for external applications had one of three organic origins. Shellac comes from a parasitic Asian insect. Paraffin comes from petroleum. Oil stains, varnishes and sealers also originate as petroleum products. You can still use some version of any of these three substances effectively on a wooden fence, but, more recently, synthetic hydrocarbon finishes, particularly polyurethanes, have become more popular for this kind of exterior use than the earlier organic compounds because they offer distinct advantages. A polyurethane finish will preserve the natural color of a wooden fence. 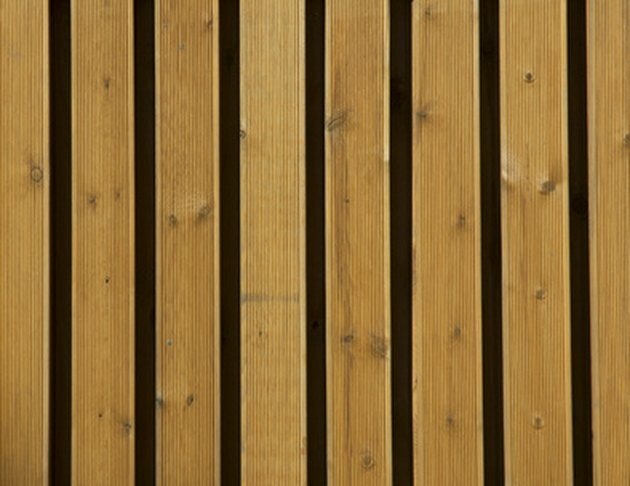 Some homeowners still use petroleum-based oil stains to protect wood fences and to maintain their appearance. Almost all oil-based stain products for external use incorporate both the color stain and the oil in a single product. You do not need to put a preliminary sealer on the fence. Because oil stains penetrate the wood, they resist chipping and similar problems, offer some degree of resistance to ultraviolet light and have a fairly high service temperature range--you can use them in both hot and cold climates. However, so-called "polyurethane" finishes (actually a combination of alkyd and polyurethane resins) will last longer, have a wider service temperature range and offer other advantages. Urethane has a somewhat simpler chemical identity than polyurethane and consists of five specifically arranged atoms. Polyurethane, as the name implies, consists of many (poly) urethane chains, or polymers. Both urethane and polyurethane staining products work well. The more complex molecular structure of polyurethanes accounts in part for their greater durability in comparison with urethanes, and their slightly superior resistance to oxygen and ozone. Most contemporary polyurethane formulations consist of a blend of an alkyd resin (also used in varnishes and oil-based paints) and a polyurethane resin. Do not confuse these alkyd and polyurethane blends with "polyurethane" water-based products; these have very different characteristics, and lack the durability of alkyd-based polyurethane blends. Polyurethane compounds will incorporate various staining substances in suspension, much like oil-based stains. But polyurethane stains test better than oil-based stains in several areas: service-temperature range, hardness, flexibility, resistance to bio-degradation, higher load-bearing capacity, tear strength, compression set, abrasion resistance, and tolerance to grease, ozone and a variety of organic and inorganic oils. A polyurethane-stained fence post may not require maintenance much more than once every ten years. The only real disadvantage of polyurethanes is cost; they generally cost about half-again as much as a pure oil stain, and with some proprietary polyurethane products, even more. Using a sealer under an exterior stain finish provides no advantage generally, but will do actual harm in association with polyurethane finishes. Bob Flexner, an authority on wood finishing, points out that a sealer functions "primarily to make the sanding of the first coat easier and faster," but that "they weaken the bond of the finish," and that "polyurethane bonds especially poorly to sanding sealers." In external applications, like finishing a wood fence, you would not sand successive coats to begin with, and the last thing you want to do is weaken the bond between the polyurethane finish and the fence. What Is the Difference Between Deck Stain and Indoor Wood Floor Stain?